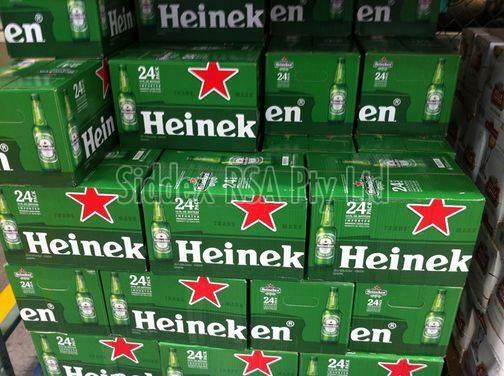 We are wholesale suppliers of Heineken Beer from Holland. We have a huge supply ability and can supply you any quantity. Supply will be done as per the below specifcations. packing: 250 ml bottles and cans best quality from holland affordable price heinekens packing: 250 ml bottles and cans best quality from holland affordable price quick delivery heinekens beer from holland packaging: 250ml bottles and cans 24 bottles per carton 26 pallets per 40'fcl 91 cartons x 24 cans of 250ml per pallet 2366 cartons per 40 ft. dry container. available in cans and bottle (250ml, 330 ml & 500 ml) . ready for international shipping with competitive price. container 20 feets can fully loaded with: - 2, 240 cartons x 24 cans and bottle (330 ml) - 1, 520 cartons x 24 cans and bottle (500 ml) - 1, 010 cartons x 24 bottles (330 ml 250ml bottles 24 bottles per carton 26 pallets per 40'fcl 91 cartons x 24 cans of 250ml per pallet 2366 cartons per 40 ft. dry container.